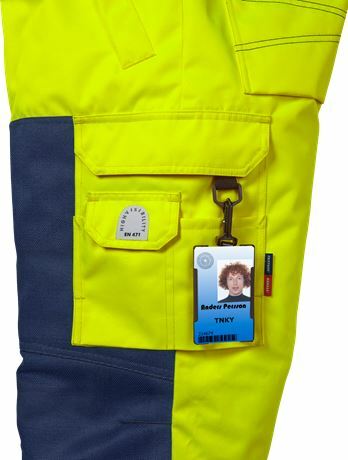 Strong and durable high visibility winter trousers in dirt, oil and water repellent material. 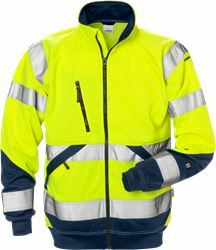 Material: Polydex, 100% polyester, dirt, oil and water repellent. Quilted lining: 100% polyester. 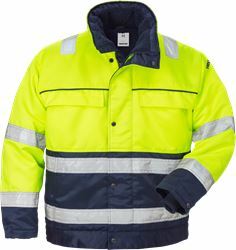 Weight: Outer fabric 255 g/m², lining 130 g/m². 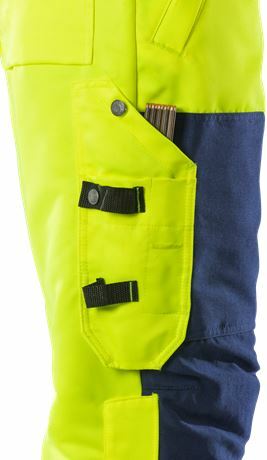 Polydex, dirt oil and water-repellent / Fully lined / Belt loops / Adjustable waistband / D-ring / 2 front pockets with covered zips / Double reinforced crotch seam / 2 back pockets with flaps and velcro fastening / Folding rule pocket with pen pocket, 2 buttons and loops for 2 sheath knifes / Leg pocket with flap and velcro fastening , mobile phone pocket with flap and velcro fastening, and D-ring with plastic ID-card holder / Pre-shaped knees / CORDURA® reinforced knee pockets with inside opening / Height adjustment for knee pads in knee pocket / CORDURA® reinforced thigh / Short zip at leg ends / Adjustable leg ends / CORDURA® reinforced leg ends / Approved according to EN 14404 together with kneepads 124292, EN ISO 20471 class 2 and EN 342 / Leasing laundry-tested according to ISO 15797 / OEKO-TEX® certified.